I know that there are some of you who can run a marathon in under four hours like it’s nothing. Then there are the rest of us who dream of finishing those 26.2 miles in four hours or less. I’ve never been naturally athletic, so breaking the four hour mark was a really big deal for me. I put in a lot of work and made some mistakes along the way, but I was eventually able to meet my marathon time goal. Are you hoping to run a sub-4 hour marathon? Here I’m compiling the biggest things that I did that helped me along my journey. I worked up to running a sub-2 hour half marathon. Some people have natural athletic talent and just start out running quickly. I am not one of those people. I trained for just under a year to be able to run a half marathon in under two hours and I trained hard. Working up to running shorter distances at the 9:09 minute/mile pace you’ll need to run that 4 hour marathon provides easy stepping stones along your training path. I increased my mileage. 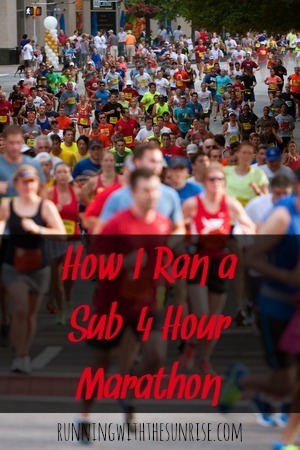 I was running about 40-45 miles a week when I trained for my sub-2 half marathon. When I trained for my full marathon, I increased that to 50-55 miles a week during my peak training. You don’t necessarily need to run really high mileage to get fast, but adding in extra easy miles helps your body get better at running. I incorporated more speedwork into my training. It makes sense when you think about it—you have to run faster to get faster. Early in my training plan, I incorporated strides into my workout, working on leg turnover and running efficiency. After a few weeks of training, I added in tempo runs and Yasso 800s, running the 800 m at an 8:00 min/mile pace. I wanted to make sure I was increasing my VO2 max to make running at that 9:09 pace easier. Nailing my last set of Yasso 800s also gave me confidence that I was at the right level of fitness to run that sub-4 hour marathon. I made sure to get strong and limber. I started practicing yoga twice a week when I was training for my half marathons and added a weekly class to my routine when I was training for my marathon. 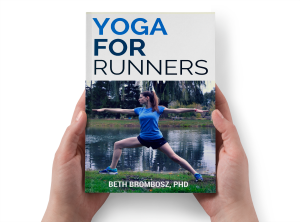 Yoga is wonderful for runners and can help prevent you from getting injured. I also made sure I was using my foam roller on my legs 1-2 times daily and also got massages every other week, making sure that little knots and adhesions didn’t develop into injuries. Marathon training was my primary goal. When I trained for my sub-4 hour marathon, my marathon training was the only big thing I had going on at the time. I was in graduate school but didn’t have any extraordinary tasks that I needed to accomplish. I learned this one the hard way. I trained for another marathon while I was writing my dissertation and planning my wedding. 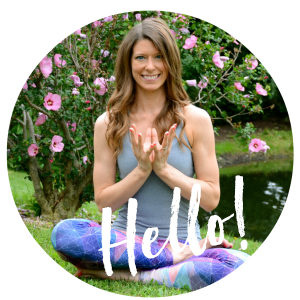 I was crunched for time so I stopped going to yoga, which allowed my glutes and hip stabilizers to weaken, leading to a bad hip flexor injury. I had to DNF at mile 14 of the Chicago Marathon which was just heartbreaking after months of training at 60+ miles a week. Moral of the story: marathon training takes a lot of effort, so be sure that you don’t have too much going on. Too much stress in your life while you’re training for a marathon can leave you sick and/or injured! Faster runners: do you have any tips to add? Do you train to meet time goals? Thank you SO MUCH for sharing this. I’m training for my first marathon and I have zero time goals at this time, but I know if I finish and I can handle the training, there will be another marathon in my future which I’ll probably do for time. My HMP is just over 2 hours so I’ll heed your advice and aim for a faster half first. Thank you! I think this is great! I think something else to add is to stick to the plan during the training (don’t overdo it and get injured) and to have a plan going into the run the day of–don’t go out too fast! I am dreaming of a sub-5 marathon! After I signed up for my full I had a lot of stuff happen in my life unexpectedly that took away from training so I went into my race with one goal – finishing. I’m going to train again this year but I really don’t know if I want to devote the time to run 40-50 miles a week. There are so many other activities I enjoy that would have to take a backseat in order to run that mileage every week! I am hoping to get under 5:00 this time, which should be doable since I *should* be able to dedicate more time to training this year. All of your tips will apply so I am saving them to go back to this summer. Thanks for sharing! I would love to get a sub 2 hour half. I know that I would need to commit to my running a lot more first. What was your half marathon time before? Love it! Expert advice 😉 I’ve done the sub 4 thing twice. It is possible!! Now I just run for fun because I love 26.2s…and soon I hope to say I LOVE ultras! I’m hoping for a sub-4 hour marathon this year. That’s my BQ. I just want to do it. I think it’s a stretch, but my coach thinks I can, so I have to think that way too! Just wondering… since this was posted last year. Did you ever get that sub-4 then? If so, could you please share the plan you used, Thanks! I do train for time goals! And a sub 4 was my big goal for last year’s chicago marathon! I think that running for a cause helps! When you are tired and weak, knowing that you are raising money for an amazing organization or people who can’t run always helps me through! Thanks for the tips! I hope to run a marathon someday and these are great to know. I definitely agree with the stress one – I was super stressed last summer after a lot of big life changes and my running suffered a lot. If I run a full, I’ll make sure to be as stress-free as possible! I guess for me, the one thing that made me a better runner was to log more miles. Simply just spend more time on my feet. Everybody wants shortcuts, you know? Including me. 🙂 But to get better at running, we need to do it more. Slowly adding in more miles per week is one way to do it, while really listening to our bodies (back off a bit if something feels janky and then get back into upping the miles as soon as the body shushes down again).